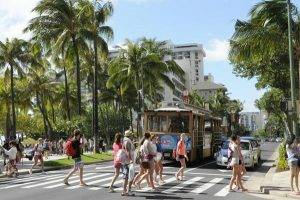 Here is our Waikiki travel guide featuring local Waikiki activities and tourist resources as well as other Oahu and Honolulu tourist attractions. If you don’t see what you’re looking for in this list, or want more suggestions for what to do in Waikiki, feel free to call us at (866) 543‑3650. We’re happy to answer any questions you have! Kuai Mart – (808) 942‑2168 on the Ilikai Lobby Level. 3 blocks away walk across the street towards McDonalds, continue towards the mountains. At T, turn right. Food Pantry is a ½ block on your left hand side. Eaton Square also has a Post Office & Bank. Ilikai Restaurants 1777 Ala Moana Blvd. Waikiki Modern Hotel (Hotel in between Ilikai & Ilikai Marina) 1775 Ala Moana Blvd. Kewalo Basin Harbor is where the charter boats are, at the end of Ala Moana Beach. Approx 20 – 25 minute walk through the Ala Moana Beach Park. Most have transport vans. Ask the Concierge or, visit the Kewalo Basin Harbor website for links to various tours.